But since most of us are not fortunate enough to own as many homes as we like and spend our time traveling between them, we have to pick a place to live. That’s where it gets tough. Should you live in the mountains and travel to the beach, or vice versa? Live in the city and take rides in the country? Do the snowbird thing and spend the summers up north and winters in FL (not an option for most of us who have to work)? The fact is, to find your best place to live you’re going to have to give something up. 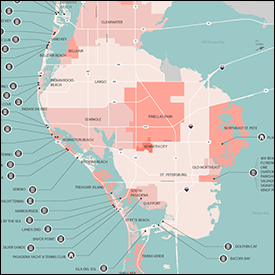 So, is Pinellas county the best place to live in the U.S.? I submit to you that yes, it is. We have 33 miles of white sand beaches, considered by many to be the best beaches in the U.S. St. Pete Beach just won TripAdvisor.com’s Traveler’s Choice 2012 award, naming it the top beach destination in the United States. Fort De Soto Park was named top beach in the nation by Dr. Beach in 2005, and Caladesi Island State Park received the same honor in 2008. The waters in the Gulf of Mexico are warm, clean and clear, offering swimmers temperatures from the low 60’s in the winter (when its mostly Canadians in the water) to the high 80’s in late summer. Boating Magazine awards the Tampa / St. Petersburg area 5 out of 5 stars in their 10 Best Places to Live and Boat. We are surrounded by beautiful water everywhere you look. Madeira Beach has the only McDonald’s in the country that has their own dock (really, I have been there, at midnight, on a boat). When you park at Publix in Treasure Island, you face water AND their dock, which is very convenient when you need a quick stop at the store on your way out for a day on the water. Whatever type of boating you like to do, whether it be sailing, cruising, water skiing, fishing, or just hanging out with other boats along one of our uninhabited islands, Pinellas county is a paradise for boaters of all kinds. Did you also know that the St. Petersburg area is the sunniest place in the United States, with an average of 361 days of sun per year? You never have to worry about Seasonal Affective Disorder (SAD) here. And the sunsets! Since we are on the left coast of Florida we get gorgeous, waterfront sunsets without having to go to California. Want to do the Jimmy Buffett, beach bar thing? You don’t have to go Key West. St. Pete Beach is the only place in the United States where you can spend a whole day walking on white sand beaches going from beach bar to beach bar, many offering live music daily. It’s not just about sun, water and beaches, however. We have big league sports, including the Tampa Bay Buccaneers, the Tampa Bay Rays and the Tampa Bay Lightning. We have world class arts and music, like the Salvador Dali Museum, the Chihuly Collection, the Florida Orchestra, the Mahaffey Theater, and Ruth Eckerd Hall. Looking for nightlife? You can’t beat downtown St. Petersburg, and Tampa and Ybor City are just a short drive away. night from 6:30 to 10:00, a family event offering music, street perfomers, crafts and more. Treasure Island hosts the John’s Pass Seafood Festival and John Levique Pirate Days every year. I am just scratching the surface here - every town in Pinellas has their own festivals and events, and there something fun going on virtually every weekend (and often during the week). Have you ever heard of a Christmas Boat Parade? I sure hadn’t before I moved here. All of the beach towns have them. This is where a group of boaters decorates their boats (and often themselves) with all sorts of lights and decorations, and then parades through all the waterfront neighborhoods. People gather in their backyards for Boat Parade parties and cheer on the boats. We were in the Treasure Island Boat Parade last year, and there were more than 50 boats. It’s a blast! 2011, and housing inventory is down almost 80% from where it was 2-3 years ago. We have worked through most of the short-sale and foreclosure inventory at this point, and the market has really turned around. It’s a great time to buy a home in Pinellas! There are a lot of great places to live in the U.S. and I could he happy in many of them. We looked long and hard when we made the decision to move away from the Washington, D.C. area some years back, and we could have gone anywhere in the country. When you consider the water, sun, weather, amenities and activities, and combine that with the laid back lifestyle, nice people, and light traffic, it’s really a no-brainer. For me, Pinellas county is the best place to live in the U.S.! Great article with wonderful resources on all of the fun things to do in the area. I am looking forward to doing many of them when I come down!